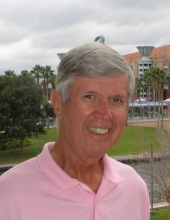 John R. Burns, Jr., age 79, of Foxborough, passed away on March 14, 2019 at Boston Medical Center, surrounded by the comfort of his loving family. He was the son of the late John and Antonina (Augustinovich) Burns. John was born in Lawrence on July 1, 1939. He and his late wife Carole were married at Gate of Heaven Church in S. Boston on October 4, 1958. They moved to Foxborough in 1963 to raise their family. John was an electrical engineer for Charles T. Main and Stone and Webster of Boston for over thirty seven years. He retired in 1994, at the age of 55. He enjoyed frequent visits to Twin Rivers Casino and Raynham Park, which his family referred to as “the office”. He took pleasure in fixing things, building furniture, and remodeling for his family. He enjoyed winter vacations in Florida and traveling with friends and family. Most of all he will be remembered as a very kind man, father and friend. Beloved father of John R. Burns III and his wife Christine of Foxborough, David Burns and his wife Christa of Scituate, Linda Burns Donaghey of Foxborough and her former husband Kevin Donaghey of Raynham. Devoted grandfather of Melissa, John IV, Delaney, Liam, Aidan, Stephen and Caroline. Great grandfather of Mason, Maddie and Nora. He also leaves behind his beloved dog, Brady. Relatives and friends are kindly invited to attend calling hours on Tuesday, March 19 from 4 to 7 PM at the Roberts and Sons Funeral Home, 30 South Street, Foxborough. A Funeral Mass will be celebrated on Wednesday at 10 AM at St. Mary’s Church, 58 Carpenter Street, Foxborough. Interment to follow at St. Mary’s Cemetery, Foxborough. For additional information please contact 508 543-5471. To send an on-line condolence please visit the funeral home web site at www.robertsandsonsfuneralhome.com. In lieu of flowers, donations in John’s memory may be made to the American Heart Association, 300 5th Avenue, Suite 6, Waltham, MA 02451. "Email Address" would like to share the life celebration of John R. Burns. Click on the "link" to go to share a favorite memory or leave a condolence message for the family.